Wilderness First Aid Kit - What do you need in a wildernes first Aid Kit? If you are heading out to the wild blue yonder you will need a wilderness first aid kit. We have put together a wilderness first aid kit checklist which is the minimum of what you should be taking with you. It will help you to put together a first aid kit that will tackle many injuries and ailments that might come your way. If you are going on an extended trip, travelling in uncertain weather or unfamiliar territory, you will need to add additional supplies. When going out into the wilderness you need to research the area you will be going into. Some areas may have dangerous or venomous wildlife including snakes and spiders or harmful plants. Other areas may have non drinkable water that could harbour nasties such as giardia or the like. Then if this is so you will need to take fresh water, a filter or iodine tablets. Wherever you intend to go a wilderness first aid kit is a must. A good comprehensive outdoor first aid book. Your preferred pain relief tablets or capsules. Antihistamine to control mild allergic reactions. Antiseptic - We like Betadine individually wrapped swabs as you can either wipe a wound over or squeeze the swab so droplets can be applied to a wound and they take up such little space. Burn gel with Aloe vera is our preference. Aloe Vera aids in healing, pain relief, has anti-inflammatory properties, help prevent blistering and scarring. Hydro-cortisone cream for skin inflammation and rashes. Stings and Bites cream - We prefer one with a local anaesthetic that helps reduce the itchiness of bites. Cold sore cream - if you are prone to cold sores sunlight and sunburn can trigger them so take some cold sore cream. Zorvirax is our preference. Electrolyte replacement powder or dissoluble tablets - for when you are in humid temperatures and sweating out your bodies salts and minerals. Or if you suffer from vomiting and/or diarrhoea. Antiseptic wipes or gel - for cleaning your hands before touching open wounds. Having a separate bottle or wipes, for using after you have been to the loo as such, is a great idea too. Band Aids - a variety of shapes and sizes for cuts and scrapes . We find the long strips of fabric tape with the padding already in place is great because you can cut it to any length then seal it down with adhesive tape if needed. Adhesive Tape - We prefer paper tape as you do not have to have scissors to cut it as it will tear by just using your fingers - Get a good quality tape that will not get brittle with age or lose it's stickiness. It is useless when that occurs. Gauze and non-stick dressing pads - preferably sterile. They come in all sizes. One option if you are trying to save space is to get a bigger size dressing as you can cut to size as needed. It will save space. Elastic and crepe bandages - a few different widths. Triangular Bandage - For slings, padding, strapping limbs to splints if a fracture is suspected. Two tongue depressors or ice block sticks for finger splints. Normal saline 10ml vials for the double use as an eye wash or wound cleansing. Tweezers - A good pair of tweezers has easy-to-grip handles and can be used for splinter removal and other first aid procedures. Curved Scissors - Scissors come in handy and have many uses. Curved medical ones are great as they don't have sharp points. In an emergency you might need to cut clothes away from an injury site and it is easy to poke through something and cause further injury when you are in a hurry or under stress. Instant Cold Pack/s - These are so useful with bruising, swelling and sprains. They are single use, so if you have space grab a couple for your kit. Torch - wind up or the shake type so you do not need to carry batteries. Knife - A multi purpose must-have tool that serves so many uses. Safety Pins - We use tape to do most of the jobs that safety pins do although tape fails if your pants zipper breaks, tape just does not hold it together. Safety pins win here. So good idea to pack a few. Duct tape - this has many uses. The standard roll of duck tape takes up a lot of room in a pack so find something small to re-wrap it onto like a pen but be careful, if the edges roll up and stick to the next layer it will be very difficult to unwrap when you need it. Moleskin - great for blisters and chaffing skin. Moleskins are artificial skin that you can cut to shape and stick to your own skin. Moleskin can be purchased in most drug stores/pharmacies in a variety of brands and features. Snake bite kit - This is only necessary if the location to which you are going to has venomous snakes. There are different schools of thought about snake bit kit contents. So check out where you are going and what snakes are present there. If you take one know how to use it. Also check out our Snake Bite pages. Sunscreen - for the prevention of sunburn. Mobile phone - charged. You will also need to check whether mobile service will be available in the area you are going to be in. Be sure to take any personal medication. If you are going with a group you will need to take into account other team members medical requirements or ailments. Be familiar with any of their special medical needs like asthma or allergies to bee-stings. If anyone in the group has allergies that trigger an anaphalactic reaction then an epi-pen will need to be carried. It is very important that more than one person knows how to use it. When an accident or injury occurs you may not have much time to read a manual while trying to give first aid to an injured person. 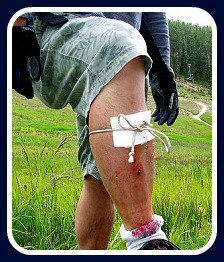 We at FirstAidanywhere.com recommend you do a Wilderness First Aid Training Course to learn what first aid challenges you may encounter and how to treat them. The course you choose should include recognition of hypothermia and hyperthermia, dehydration, fever, infection and shock as well as how to stop bleeding , how to stabilise a fractured limb , and how to treat burns, cuts and scrapes, snake, spider, insect bites as well as other injuries. We have said it on other first aid kit checklist pages but will say it again, never be complacent and always take a wilderness first aid kit with you. The one time you don't will be the time you need it. Hope you enjoy your adventure.